The most efficient electric wheatgrass juicer for home use is now available with stainless steel juicing parts. This wheatgrass juicer is also ideal for juicing soft fruits and berries. No aluminum parts. It's easy to operate, affordable, and fully guaranteed. Pulp comes out as dry as rope. Be a juicer pro and make the ultimate green drink with the MJ550 home juicer! 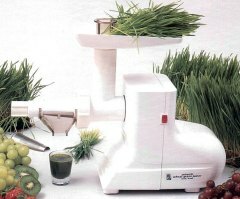 There are many manual wheatgrass juicers in the market, but if you intend to juice wheatgrass frequently, go for an electric one, the Miracle wheatgrass juicer. This Miracle wheatgrass juicer is the first electric wheatgrass juicer in the market, is suitable for home use and definitely portable due to its light-weight. This light-duty juicer can also be used to juice vegetables, soft fruits and berries. The low RPM at 90 ensures that enzymes in juices are preserved. This new-entrant is a beauty and supposed to aim to reach the budget-conscious juice lovers. At slightly more than 6 pounds, the Miracle wheatgrass juicer is easy to use and a breeze to clean. Dimensions: 8.5" high 5.5" wide, 20.25" long.